Archive for the ‘Devotions’ Category. When I introduced the series last week, I encouraged you to consider praying about how you could spiritual grow your family this new year. 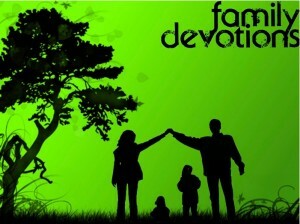 (http://www.parentingwithscripture.com/no-not-new-years-resolutions-time-again/) This post focuses on family devotions. Following are ideas for all ages and levels of readiness…those who want to just get their toes wet, to those who want to dig in deep! Regular family devotions are some of our favorite times we share as a family. They give us a chance to learn, discuss, and go deeper with each other and God’s Word. If you aren’t sure where to start or are looking for something fresh and new, I have a few suggestions. Try out http://www.itstartsathome.org/familynight/. This page has 24 creative ideas for families with all ages. Try the Jesus Storybook Bible: Every Story Whispers His Name. I had heard many families rave about this book, but thought my upper elementary kids were too old for it. Then a blogger friend wrote, “In my ever so humble opinion, every human being on the planet needs to read it, because it clearly and plainly (in words that yes, even a child can understand) tells the story of the Bible. The story of a baby sent from God to rescue the ones He so desperately loves.” (http://sheridacon.com/2013/11/12/quiet-time-god-series-part-3-bible-reading/) Now that we are reading it, I completely agree! Simply pick up the Bible and read through it with your family. This is so simple, yet intimidating to many…including me! But it’s not as daunting as you might think. An excellent resource for this is Carrie Ward’s Together: Growing Appetites for God’s Word. It chronicles her journey of craving God’s work and tackling the seemingly crazy idea to read through the whole Bible out-loud with her preschoolers! I’m not sure I would even tackled this approach (I’m sad to say!) if it weren’t for our church body reading through the New Testament together last year. This blog link shares a bit on how we got started. 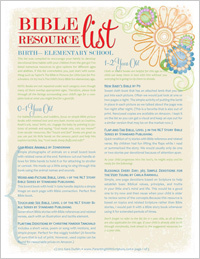 http://www.parentingwithscripture.com/nt-reading-plan-for-the-new-year/ It went great and I’m thrilled we did it! …I struggled to find a picture of a real family with all age kids as an image to represent this post. I think that’s because there is no ideal or right way for family devotions to “look.” Families are different, and therefore methods will be different! Praise God for His Word meeting our unique families with whatever our needs are and however that looks. Join the Durbin family devotional time and you will be amused that to see that our son is often hanging off the couch upside down. (No judging unless you’ve had a young boy. We do discuss respect, but we also have to pick battles.) And somehow, settling in for devotional time is a cue for our two dogs to go CRAZY acting like pin-balls around the room! This sets off our animal nurturer daughter trying to get them to calm down. Even with all that going on, we treasure these special times we carve out of the day.